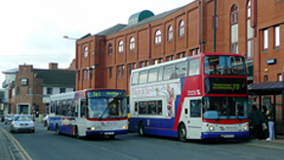 A man has been charged with a series of sexual assaults on women travelling on buses across the Black Country. Zeeshan Ali, 23, of Lichfield Road, Walsall, appeared at the town's magistrates' court. He is accused of indecently assaulting five women on buses in Walsall and Sandwell. The attacks are alleged to have happened between May and August. Mr Ali was arrested in Darlaston on Tuesday. He was remanded in custody and is due to appear at Wolverhampton Crown Court on 1 November.